Trappy, Our Venus Fly Trap! Visions of 'Little Shop of Horrors' in my Kitchen!! My kids were thrilled when they came home from school and found this cute little Venus Fly Trap on my kitchen counter. Who wouldn’t be thrilled? 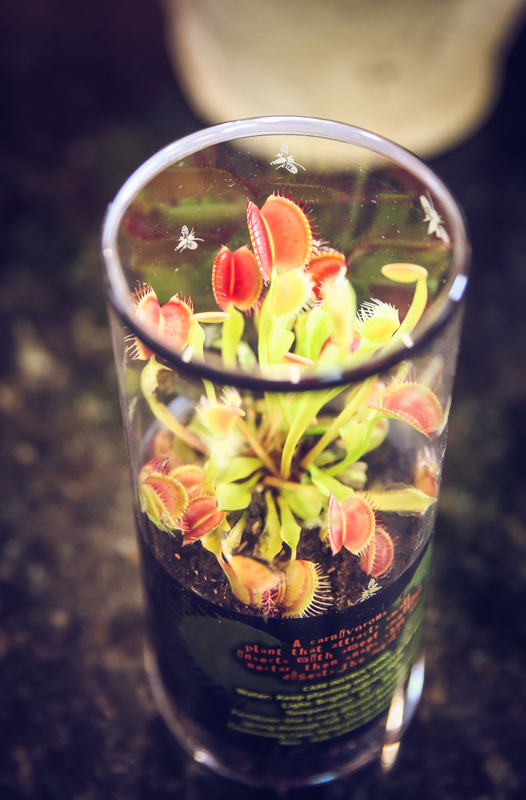 The label read “The Hungry Venus Fly Trap that captures insects for its own meal.” And they describe the plant as a carnivorous plant that attracts small insects with sweet smelling nectar, then snaps shut and digests the meal! Yikes…but it was kind of cute looking (in a strange, creepy way). We carefully read the directions on the container it came in. Just look at sweet Morgan smiling at Trappy! This was before she discovered that this plant would eat the cute little caterpillar that Zach fed him!! Once she saw 1/2 of the little bug hanging out of one of Trappy’s many “mouths,” she was not smiling so much! Water: Keep planting mix moist at all times. Fertilizer: Use a very diluted fertilizer monthly (spring through fall). DO NOT FEED WITH MEAT! Continuing Care: Keep plants at (35 – 50 degrees F) from November – February when dormant. Trappy will even try to grab on to a pencil! Seems easy enough, right? So I can easily help them keep the soil moist at all times. I can keep it in the kitchen window for bright light. The temperature in our house is always above 65 degrees and below 80 degrees! DO NOT FEED WITH MEAT – since I don’t cook much anyway, that shouldn’t be a problem! I don’t plan to be in charge feeding it anyway – Zach & Morgan can be in charge of catching flies and other creepy bugs to feed to it! Use a diluted fertilizer? Really? This is one I wasn’t thrilled about. I might as well have gotten another pet… I don’t think we’ll be using fertilizer. We’ll just cross our fingers that Trappy (that’s what the kids named him), will grow up healthy and stay alive all on his own without fertilizer! I know that you are all wondering where you can get your own lovely Venus Fly Trap. Am I right? Well, if you do not live near a Market Street grocery store, you can check out the several options of Venus Fly Traps at Amazon. They have lots of fun choices to pick from! They even have seeds you can buy. Who knew? I’m regretting my decision to buy the Venus Fly Trap plant just a little bit though. There is something that didn’t cross my mind at Market Street when I saw it sitting on the shelf and decided to get one. Here’s the one problem I have with Trappy being in my kitchen… Each time I pass him, I can hear him saying “Feed me, Seymour.” I know this is giving away my age, but how many of you saw Little Shop of Horrors?? Trappy reminds me of Audrey II from the movie. If you haven’t seen it yet, it is a very strange musical about a nerdy guy named Seymour who works at a floral shop. He comes across a strange plant which he names “Audrey II” after a girl he has a crush on at the floral shop. This strange little plant from the movie, that reminds me of Trappy, our Venus Fly Trap, develops a soulful R&B voice, uses some pretty bad language, and has a thirst for human blood. Creepy, right?? Here’s a picture of Seymour (played by Rick Moranis) and Audrey II from Little Shop of Horrors! See why Trappy is creepin’ me out?? 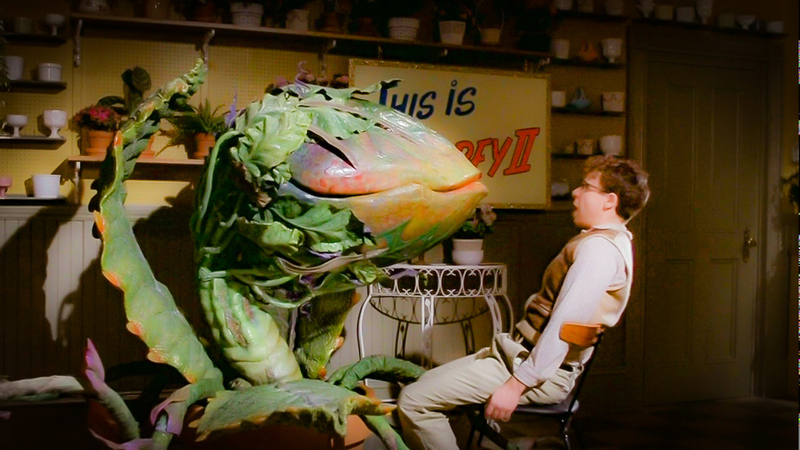 Audrey II grows larger and larger in the movie and becomes quite mean, but Seymour is liking all of the attention that comes with this unusual plant. However, Audrey II needs a lot of fresh blood to survive! I saw the movie many years ago, and thought it was interesting, but strange. And now, since we got our Venus Fly Trap, each time I pass him in the kitchen I can hear Trappy saying “Feed me, Seymour!” Just like Audrey II in the movie Little Shop of Horrors (available on DVD)! I’m totally creeped out. Pretty leaves! Just don’t like to look when Trappy is eating! As I was writing this blog post, I did do a little reading up on the Venus Fly Trap. It is actually sort of interesting. It is described as a carnivorous plant native to subtropical wetlands on the East Coast of the United States. It catches its prey – mostly insects – by trapping it with its leaves. The leaves are triggered by 6 tiny trigger hairs on the inside surfaces, and when an insect comes in contact with a hair, the trap closes itself if another trigger hair is contacted within 20 seconds of the first touch. This method of waiting to snap shut until a 2nd hair is touched is designed to keep the plant from wasting energy on something that does not have any nutritional value. Now…you must agree that is pretty cool. Be sure to check out this video from the Discovery Channel of a Venus Fly Trap Catching Flies! It shows a very detailed, close up shot of the trigger hairs and the fly eating the sweet nectar off the surface of the leaves, until suddenly – SNAP! Being a total science nerd, I found this fascinating! So did my kids – well not Morgan. She liked it, but she was sad that the fly had to die! 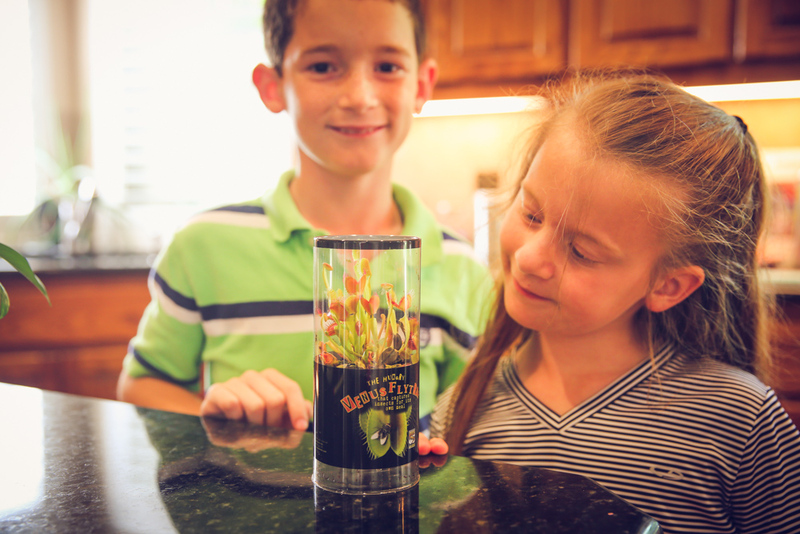 If you do decide to get yourself (or your kids) a Venus Fly Trap, you might want to read up on them. 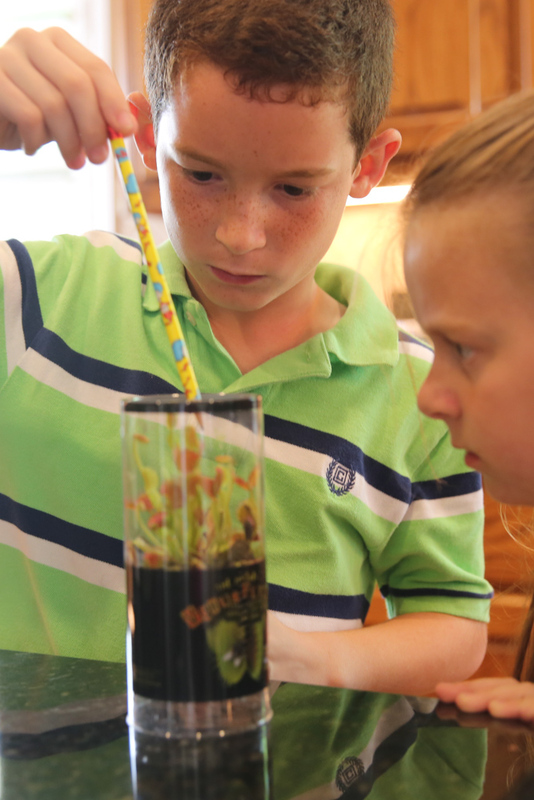 You can find information on the care for a Venus Fly Trap at www.flytrapcare.com. You can also find some good, general information about them on the website of the Botanical Society of America! They have an entire page of information. Now…here’s what I’m thinking… If they really do what the label says, and they attract bugs and insects, it might be a nice thing to have in my kitchen window. No more fly swatter for me. Wouldn’t that be nice? PreviousEmporium Pies in Bishop Arts District…YUM! Next50mm Prime – You MUST Get This Lens! !